OK, today we’re going to talk about the BIG “A” word… AMORTIZATION that is! The length of time it takes you to pay off your entire mortgage is called the amortization. But don’t fall prey to the misconception that a longer amortization is better. In most cases, the opposite is true. 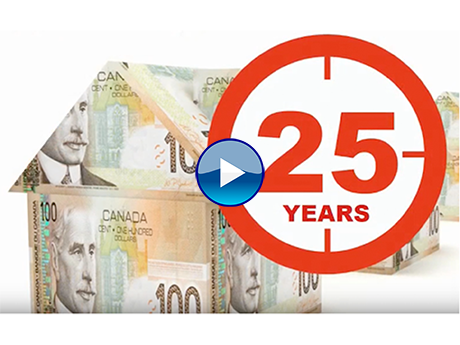 Most Canadian mortgage holders choose a 25-year amortization. That means if you make only your normal monthly payments, it will take 25 years to pay off the mortgage. Longer amortization periods are available if you make a down payment of at least 20%, but if you opt for a CMHC-insured mortgage, the maximum amortization is 25 years. However, shorter amortization periods are also available. People choose longer periods because the monthly payments are lower. This makes the mortgage seem more affordable and lets first-time buyers get into the market sooner. But in reality, longer amortizations are much LESS affordable because the loan is being paid off more slowly, so total interest costs are much higher. For instance, let's say you get a $300,000 mortgage at 4%. If your amortization is 15 years, your total interest cost would be $98,541. But if your amortization is 25 years, you'd pay a whopping $173,418 in interest! Before you opt for a 25-year amortization, please give us a call for a free analysis that will help determine if you're making the best choice.